Brad Jashinsky's blog at the intersection of marketing, technology and entertainment. What’s it like working at Knott’s Berry Farm in Marketing? I was recently asked that question and more during an interview for the Berry Vine, Knott’s Berry Farm’s newsletter for associates. As the Digital Marketing Manager for the Knott’s Berry Farm Resort, I have the great opportunity to oversee a number of exciting new areas for the company. I am responsible for leading the creation and execution of the digital strategy for the entire Knott’s Berry Farm Resort including the Knott’s Berry Farm theme park, Knott’s Soak City Water Park and Knott’s Berry Farm Hotel. My responsibilities include overseeing digital content creation, digital PR, social media, website content creation, mobile app content, digital ad buys and digital analytics. Many of the areas that I work on didn’t even exist a few years ago. The everchanging landscape of digital marketing is both exciting and challenging at the same time. 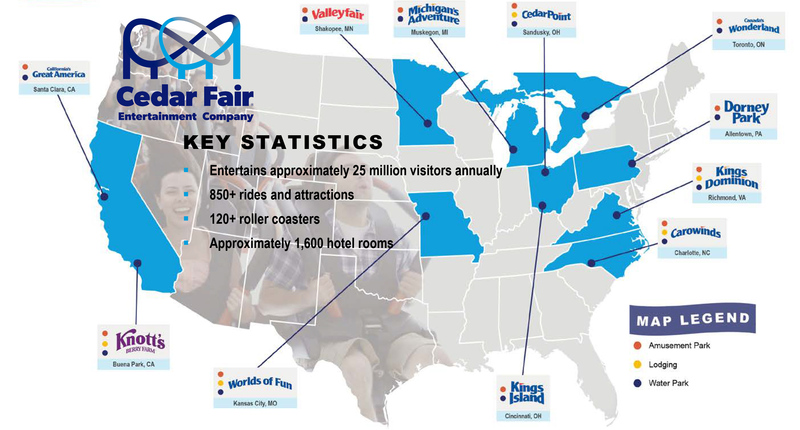 In today’s post, I take a closer look at how the different parks in the Cedar Fair chain contribute to the company’s overall revenue and EBITDA. As both a fan and member of the amusement park/theme park industry, I am always searching for ways to learn more about the many incredible companies that operate parks all over the world. Although I enjoy putting on my “fan hat” from time-to-time to read speculation and theories about new rides, I find the most interesting insights come from looking at each business holistically. At the end of the day every park is a business, a fun business, but still a business that is best understood by analyzing it through such a lenses. There are very few resources to turn to for coverage and data about the inner workings of the industry. The Global Attractions and Attendance Report compiled by the Themed Entertainment Association (TEA) and AECOM is one of the best resources available. Unfortunately, even that report relies on unofficial guesstimates and is considered by many in the industry, including myself, to be directionally, but not completely accurate. The most accurate sources of information are the earnings calls, SEC filings and investor presentations that the major public companies in the amusement park industry release on a quarterly basis. Unfortunately, public companies only release tidbits of financial information that typically focus on the overall company and not specific parks or areas of the business. Large conglomerates such as Disney and Comcast provide less data as the theme park business only accounts for one part of their overall companies. On rare occasions, companies will provide more insightful and complete information about how their business operates at the park level. In November, Knott’s Berry Farm teamed up with BuzzFeed to film the first-ever professionally produced 360 degree POV video of Xcelerator. We had collaborated a number of times before with the great folks at BuzzFeed. Our first collaboration was in 2015 when they covered their favorite food dishes from the Knott’s Boysenberry Festival. The relationship with BuzzFeed began with a pitch to them from our publicist in 2015 and has continued since then. The Xcelerator 360 degree project began with an email pitch from a BuzzFeed Video producer. Sometimes stories are pitched by us to them such as the recent Try Guys Knott’s Scary Farm Monster Makeover video and like in this instance, sometimes BuzzFeed pitches us a story idea. Through a partnership with YouTube, BuzzFeed Video was provided use of the exclusive GoPro Odyssey 360 degree camera rig. The BuzzFeed team was tasked with brainstorming different ways to best utilize the $10,000+ camera. One of their producers suggested filming members of their team riding a thrilling roller coaster for the first. The GoPro Odyssey packs 16 synchronized HERO4 Black cameras into an all-in-one rig that’s capable of capturing content in stunning 8K 30 FPS video. The footage from every GoPro is then uploaded to the Jump assembler program to create the final video. This summer will be my second anniversary of working at Knott’s Berry Farm. I wanted to take a quick look back and catalog some of my favorite moments. My life has been filled with great Knott’s Berry Farm memories. Some of my favorite memories growing up were at the Farm visiting with my family. To this day, I distinctly remember my first ride on the Timber Mountain Log Ride and being held up by the bandits on the Calico Railroad. During the past two years, I have had such an incredible time interacting with the supportive fan community and hearing what the park means to them. I feel truly fortunate to have been on the team that helped propel the legendary theme park to its highest attendance in its 90+ year history in 2014 and then again in 2015. I can’t wait to experience the all new GhostRider and Ghost Town Alive! this summer. The Fun Bun almost never happened. The new pastry creation was amazing. Warm. Sweet. Gooey. Delicious. One-of-A-Kind. It honored and continued Knott’s Berry Farm’s nearly century long culinary legacy, started by the boysenberry and Mrs. Knott’s Chicken Dinner Restaurant. The creation of the delicious combination of a cinnamon roll, boysenberry, funnel cake and a little magic was led by Chef Reuben, and supported by the culinary team. The culinary team called it a “Deep Fried Cinnamon Bun”, which was true, but didn’t provide the proper reverence to this fantastic new treat debuting at the Knott’s Boysenberry Festival in 2015. Enter Knott’s Publicist Leidy Arévalo. She was the brainchild of the name Fun Bun. Fun Bun is one of those great names that seems obvious in retrospect. A shortened combination of the words “funnel” and “cinnamon bun.” There was a lot of resistance from the culinary team and park management to the new name. Like most businesses, the park had never used anything but straightforward names to describe all of our food offerings. The debate centered around concerns about whether the name set the right expectations for guests. Would guests know what the new dessert was and would they be curious enough to try it? Leidy persuaded the team to give the name a chance. Voyage to the Iron Reef, the new interactive 4-D ride at Knott’s Berry Farm, opened to great fanfare on May 15, 2015. The entire Knott’s team breathed a big sigh of relief that day. Hundreds of people had collectively spent thousands of hours designing, constructing, marketing, opening and operating one of the biggest attractions in park history. Copyright © 2019 Brad Jashinsky. All rights reserved.